Following on the success of the ‘Essential Guides’ for France and for Switzerland, this book has been written to appeal to railway enthusiasts, holidaymakers and travellers who are interested in seeing both the beauty of Austria as well as much of its railway activity, new and old. The guide lists a total of 172 locations throughout Austria where railways and tramways as well as related activities can be found. 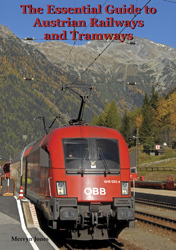 Of these, the author has identified 47 specific routes operated by Austrian Federal Railways (�BB) including the world famous Semmeringbahn. Also identified are 12 museums including the National Transport Museum at Strasshof and �GEG’s superb collection at Ampflwang. Five freight companies have been included as have 15 funicular operations. To conclude, there is a description of the railway links with Austria’s eight neighbouring countries. Many of the organisations listed have safeguarded a wide variety of material, much of which has been maintained or restored to full working order and used frequently for excursions both on private as well as �BB tracks. The range of railway activity addressed in this book has been widened when compared with the previous guides as a continuing problem has been what to include and what to exclude. ‘Heritage’ railways are relatively speaking easy to define but when do regular routes become of ‘tourist’ interest? A5 format, 208 pages, 147 illustrations.